Pools require remodeling from time to time just as your house does. Not only is that the time to create a new design theme or feature but it is also a great time to update pool equipment and take advantage of new technology and advances in the actual function of your pool. There are many different aspects of a pool remodel and a great deal of information that you should consider before starting any project. If you are interested in remodeling your existing pool or considering a backyard renovation around an old pool that you no longer use, the UNIQUE Companies is one of the only contractors who is licensed and qualified to meet all of your outdoor contracting needs. UNIQUE holds not only a pool contractor’s license from the Arizona Registrar of Contractors but also a landscape licenses AND a general contractors license as well. This makes our team UNIQUELY qualified to design, engineer and construct anything that you might like to include in your outdoor living space from a pool and spa to a sunken trampoline pit or outdoor kitchen and covered dining area. Contact the one company who specializes in total backyard transformations today. Pool resurfacing is the process of updating the interior swimming pool surface in an existing swimming pool. Pool resurfacing is not normally required until after many years of swimming pool use. Resurfacing is one of the most common projects in a swimming pool remodel. During a pool resurfacing we drain the pool, chip out the old interior pool surface and install a new pool surfacing. 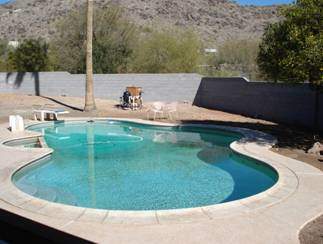 An example of an existing swimming pool before undergoing a remodeling by UNIQUE Custom Pools. 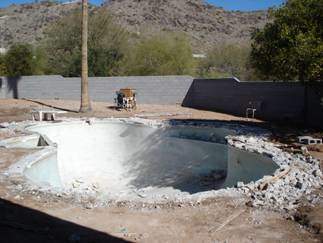 This picture shows some of the extensive work which is required when remodeling a swimming pool in Phoenix. UNIQUE Companies coordinated and completed all aspects of this pool, landscaping and flagstone patio project. The completed project! Another successful project by Unique Companies. Our clients can now enjoy their pool with some of the newest technologies in swimming pool construction. What are your options during a pool remodel? The options are almost endless. Some clients choose a chipout of the exiting plaster and then replace it with an upgraded interior such as the application of one of our new PebbleTEC or PebbleSHEEN products. There are also other interior options which include 3M Quartz, Hydrazzo, Beadcrete and Polished Pebble surfaces. The UNIQUE swimming pool designers will help determine which surface will be the best fit for your lifestyle and your budget. Our Phoenix pool remodeling portfolio is a great resource for you to use when you are exploring your options to select a new interior surface for your pool. Waterline Tile – UNIQUE clients love the opportunity to update or add the waterline tile of their choice during their pool remodel. Waterline tile is a great way to introduce a new splash of color and interest to your pool. You can choose from a single color to tiles with color variation or even a mosaic theme. You can also use your waterline tile selection to tie your pool design in with your outdoor kitchen and BBQ area. Matching tile will add a sense of continuity throughout your outdoor living space. 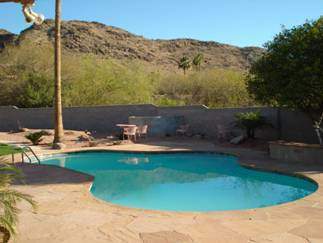 Depth Conversion or Play/Baja Step – Many older pools in the Phoenix area were designed at a time when it was very desirable to own a diving pool. But today’s homeowners are more interested in play pools and pools which offer more family friendly features. During a remodel when the plaster is chipped out is the perfect time to complete these more in-depth pool renovations. Adding steps for easy access or a bench can make your old pool much more functional and fun for the entire family. Making these types of changes is a relatively routine process that can happen efficiently during the remodel construction process. Add a Waterfall or Spa – Adding a spa to your pool will completely change the look and feel of your pool area and the function of your pool. Now you can enjoy soaking in a warm spa after a long day or playing in the pool with friends and family. During a standard pool remodeling is also a great time to add a rock waterfall or custom water feature. Not only will this add to the fun of your pool but it will also provide a beautiful focal point for your outdoor living area. Include lighting to make your new waterfall or water feature the focal point for all of your evening entertaining outdoors. Adding these upgrades to your existing pool are very common during a pool remodel and can be surprisingly affordable. Ask you UNIQUE designer about adding a new feature during your pool remodel. Upgrade Equipment / Controls – During a swimming pool remodel is the perfect time to update your swimming pool and spa equipment to take advantage of the new energy efficient models and the modern conveniences. The swimming pool industry has benefited greatly from many advances in home automation. Having an easy way to monitor your pool makes maintenance easier than ever before. And adding automated maintenance equipment means that you will spend less time testing the water, adding chemicals and trying to master water chemistry. 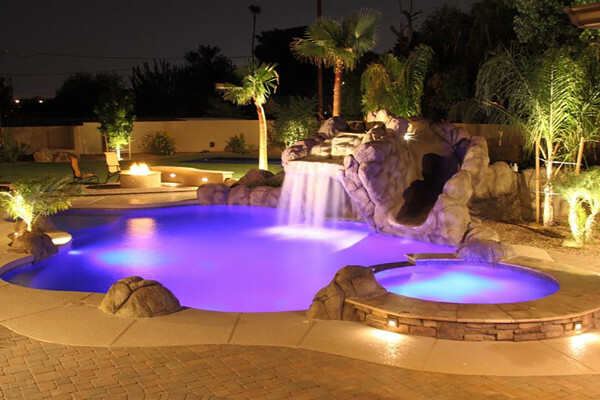 From automated systems that turn on your spa with the click of an app on your smartphone to convenient in-floor cleaning systems, salt water chlorinators, and COLOR LED pool/spa lights all of these features can be added to your old pool to provide you with cutting edge technology and greater enjoyment of your pool and spa. GO GREEN! – UNIQUE Landscapes and UNIQUE Custom Pools is very proud of our continued dedication to the environment and our vast experience in helping our customers upgrade to energy efficient and environmentally mindful equipment. During our new pool construction and pool remodels we offer clients several products which are deemed Eco-friendly pool products. These products range from Solar Pool Heating units to Energy Efficient Pumps. Our newest addition to our Green initiative is the IntelliFlo VS (variable speed) pump which can circulate and clean your pool at the cost of running a few light bulbs. Ask your UNIQUE designer how these products can be incorporated into your project to save you money and protect the environment. Patios, Landscaping and MORE! – The greatest service that we offer to our clients is our knowledge of best practices when it comes to the area outside of their swimming pool and spa. Our crews are comprised of skilled craftsmen who work on patios, pavers, travertine and flagstone on a daily basis. We have a dedicated crew who plant trees and palms, build barbecues, fireplaces, run gas lines and installs electrical and mist systems. In short, we have dedicated UNIQUE employees who will complete each and every aspect of the work which is required to complete your total backyard installation or renovation project. We are THE swimming pool and landscape company who can do it all, and even more importantly, we do it all very well.